Archive for the ‘My Career and Personal Life’ Category. Puzzle. Five pirates discovered a treasure of 100 gold coins. They decide to split the coins using the following scheme. The most senior pirate proposes how to share the coins, and all the pirates vote for or against it. If 50% or more of the pirates vote for it, then the coins will be shared that way. Otherwise, the pirate proposing the scheme will be thrown overboard, and the process is repeated with the next most senior pirate making a proposal. As pirates tend to be a bloodthirsty bunch, if a pirate would get the same number of coins whether he votes for or against a proposal, he will vote against so that the pirate who proposed the plan will be thrown overboard. Assuming that all five pirates are intelligent, rational, greedy, and do not wish to die, how will the coins be distributed? You can find the solution in many places including Wikipedia’s Pirate game. The answer is surprising: the most senior pirate gets 98 coins, and the third and the fifth pirates by seniority get one coin each. I always hated this puzzle, but never bothered to think through and figure out why. Now I know. This puzzle emphasizes the flaws of majority voting. The procedure is purely democratic, but it results in extreme inequality. That means a democracy needs to have a mechanism to prohibit the president from blatantly benefiting himself. With our current president these mechanisms stopped working. Given that Trump does everything to enrich himself, the pirates puzzle tells us what to expect in the near future. We, Americans, will lose everything: money, clean air and water, national parks, future climate, health, social security, and so on, while Trump will make money. The year is 1994. The man on the left is my first husband, Alexander Goncharov. Although we were out of touch for a decade, when I married my third husband, Joseph Bernstein (on the right), Goncharov started visiting us. It wasn’t me he was interested in: he wanted to talk mathematics with my husband. I found this situation hilarious, so I took this photo. But that’s not all. My second husband, Andrey Radul, is not in the picture. But all four of us were students of Israel Gelfand. In short, my three ex-husbands and I are mathematical siblings — that is, we are all one big happy mathematical family. 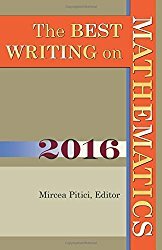 The Best Writing on Mathematics 2016 is out. I am happy that my paper The Pioneering Role of the Sierpinski Gasket is included. The paper is written jointly with my high-school students Eric Nie and Alok Puranik as our PRIMES-2014 project. Cookie Monster Plays Games—another PRIMES project written jointly with my high-school student Joshua Xiong. Mathematical Research in High School: The PRIMES Experience, written jointly with PRIMES Chief Research Advisor Pavel Etingof and PRIMES Program Director Slava Gerovitch. To continue bragging, I want to mention that my paper A Line of Sages was on the short list for 2015 volume. And my paper Conway’s Wizards was included in the 2014 volume. I married an American citizen and moved to the US in 1990. At the time I was a very patriotic Russian. It took me a year of pain to realize that some of my ideas had been influenced by Soviet propaganda. After I washed away the brainwashing, I fell in love with the US. For 25 years I thought that America was great. Not anymore. For the last several months I’ve been worried as never before in my life. I feel paralyzed and sick. To help myself I decided to put my feelings in words. World War. My mom was 15 when World War II started. The war affected her entire life, as well as the lives of everyone in the USSR. Every now and then my mom would tell me, “You are lucky that you are already 20 and you haven’t witnessed a world war.” I moved to the US while my mom stayed back in Russia. From time to time I tell myself something like, “I am lucky that halfway through my expected lifetime, I haven’t had to live through a world war.” It’s been more than 70 years since WWII ended. To maintain the peace is a difficult job. Everything needs to be in balance. Trump is disrupting this balance. I am worried sick that my children or grandchildren will have to witness a major war. The Red Button. I’ve noticed that, as a true showman, Trump likes misdirecting attention from things that worry him to fantastic plot twists that he invents. What’s the best way to make people forget about his tax returns? It’s the nuclear button. Dropping a nuclear bomb some place will divert people from thinking about his tax returns. As his plot twists are escalating, is he crazy enough to push the button? Climate. The year 2014 was the warmest on record. The year 2015 was even warmer. And last year, 2016, was even warmer than that. I remember Vladimir Arnold’s class on differential equations. He talked about a painting that had been hanging on a wall for 20 years. Then it unexpectedly fell off. Mathematics can explain how such catastrophic events can happen. I keep thinking about our Earth: melting ice, dead reefs, fish eating plastic, and so much more. My grandchildren might not be able to enjoy beaches and forests the way I did. What if, like the fallen painting, the Earth can spiral out of control and completely deteriorate? But Trump is ignoring the climate issues. Does he care about our grandchildren? I am horrified that Trump’s policies will push climate catastrophe beyond the point of no return. The Truth. Wiretapping is not wiretapping. Phony jobs numbers stopped being phony as soon as Trump decided that he deserved the credit. The news is fake when Trump doesn’t like it. Trump is a pathological liar; he assaults the truth. Being a scientist I am in search of truth, and Trump diminishes it. I do not understand why people ignore his lies. Two plus two is four whether you are a democrat, or a republican, or whomever. Facts are facts, alternative facts are lies. I am scared that lies have become acceptable and no one cares about the truth any more. Russia. I lived in Russia for the first unhappy half of my life, and in the US for the second happy half. I do not want to go back. There is something fishy between Putin and Trump. Whether it is blackmail or money, or both, I do not know the details yet, But Trump is under Putin’s influence. Trump didn’t win the elections: Putin won. This horrifies me. I do not want to go back to being under Russian rule. Gender Issues. I grew up in a country where the idea of a good husband was a man who wasn’t a drunkard. That wasn’t enough for me. I dreamed of a relationship in which there would be an equal division of work, both outside and inside the home. I could not achieve that because in Russian culture both people work full-time and the wife is solely responsible for all the house chores. Moreover, Russia was much poorer than the US: most homes didn’t have washing machines; we never heard of disposable diapers; and there were very long lines for milk and other necessities. The life in USSR was really unfair to women. Most women had a full-time job and several hours of home chores every day. When I moved to the US, I thought I was in paradise. Not only did I have diapers and a washing machine, I was spending a fraction of the time shopping, not to mention that my husband was open to helping me, and didn’t mind us paying for the occasional babysitter or cleaner. For some time I was blind to gender issues in the US because it was so much better. Then I slowly opened my eyes and became aware of the bias. For some years it has felt like gender equity was improving. Now, with a misogynistic president, I feel that the situation might revert to the dark ages. When women are not happy, their children are not happy, and they grow up to be not happy. If the pursuit of happiness is the goal, the life has to be fair to all groups. But Trump insults not only women but also immigrants, Muslims, members of the LGBTQ community, as well as the poor and the sick. The list is so long, that almost everyone is marginalized. This is not a path towards a happy society. Democracy. Trump attacks the press and attempts to exclude them. Trump has insulted the intelligence community and the courts. He seems to be trying to take more power to the presidency at the expense of the other branches of government. He ignores his conflicts of interest. Trump disregards every rule of democracy and gets away with it. I am horrified that our democracy is dying. Tax Returns. Trump’s tax returns could either exonerate him or prove that he is Putin’s puppet. The fact that he is hiding the returns makes me believe that the latter is more probable. Why the Republicans refuse to demand to see his returns is beyond my understanding. Corruption. Trump does so many unethical things. Most of his decisions as president seem to be governed by Trump trying to get richer. Let us consider his hotel in Azerbaijan—a highly corrupt country. Having lived in a highly corrupt country myself, I know how it works. For example, an Azerbaijani government official who has access to their country’s money can make a deal that involves a personal kickback. This means that their government is paying more than necessary for a service or product in order to cover that kickback. This is how national money makes its way into individual pockets. Since all the deals in Azerbaijan are reputed to be like that, I imagine that when Trump built his hotel there, the Trump organization was overpaid in order to cover the bribe to local officials. Will our country become as corrupt as Azerbaijan? Americans. The biggest shock of the election was that so many people were so gullible and actually voted for Trump. They didn’t see that his agenda is focused on his own profit, and that he lies and makes promises he doesn’t plan to deliver. It really terrifies me that there are some people who are not gullible but still voted for Trump. I already posted a funny true story that Smullyan told me when I last visited him. Raymond Smullyan died recently at the age of 97 and my mind keeps coming back to this last visit. The year was 2012 and I was about to drive back to Boston after my talk at Penn State. Smullyan’s place in the Catskills was on the way—sort of. I wanted to call him, but I was apprehensive. Raymond Smullyan had a webpage on which his email was invisible. You could find his email address by looking at the source file or by highlighting empty space at the bottom of the page. Making your contact information invisible sends a mixed message. While this was a little eccentric, it meant that only people who were smart enough to find it, could access his email address. I already knew his email because he had given it to me along with his witty reply to my blog post about our meeting at the Gathering for Gardner in 2010. In our personal interactions, he always seemed to like me, so I called Raymond and arranged a visit for the next day around lunch time. When I knocked on his door, no one answered, but the door was open, and since Smullyan was expecting me, I walked right in. “Hello? Anyone there? Hello? Hello?” As I wandered around the house, I saw an open bedroom door and inside Smullyan was sleeping. So I sat down in his library and picked up a book. When he woke up, he was happy to see me, and he was hungry. He told me that he didn’t eat at home, so we should go out together for lunch. I was hungry too, so I happily agreed. Then he said that he wanted to drive. I do not have a poker face, so he saw the fear in me. My only other trip with a nonagenarian driver flashed in front of my eyes. The driver had been Roman Totenberg and it had been the scariest drive I have ever experienced. I said that I wanted to drive myself. Annoyed, Raymond asked me if I was afraid of him taking the wheel. I told him that I have severe motion sickness and always prefer to drive myself. Raymond could see that I was telling the truth. I got the impression that he was actually relieved when he agreed to go in my car. We went to Selena’s Diner. He took out playing cards with which he showed me magic tricks. I showed him some tricks too. This was probably a bad move as he abandoned me to go to the neighboring table to show his magic tricks to a couple of young girls. They were horrified at first”his unruly hair, his over-the-top energy, his ebullient behavior”but between me and the waitress, we quickly reassured them. The girls enjoyed the tricks, and I enjoyed my visit. Like many people, I was appalled by Trump’s immigration ban. On the Internet I found many essays that explained that he did not include in the ban those majority-Muslim countries in which he has business interests. See for example, an article at Forbes with a nice map, and an article at NPR. Now the countries that are excluded are motivated to continue to support Trump’s businesses, and to offer him bribes and good deals in exchange for staying out of the ban. The countries on the list are also motivated to approach Trump and offer him a sweet business deal. So even if the courts stopped the ban, he has already succeeded in showing every country in the world that to be on his good side requires that they pay up. And China got the hint and granted Trump a trademark he’s been seeking for a decade. Looks like Trump’s vision of a great America is a very rich Mr Trump. 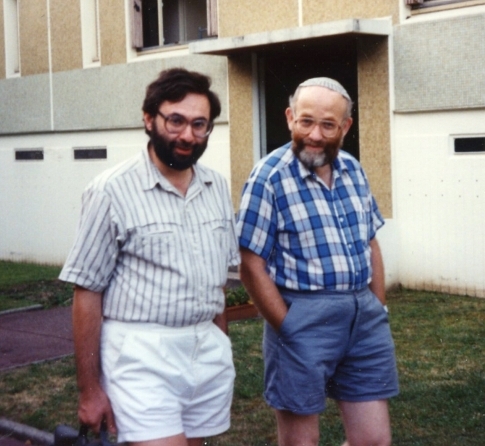 The first time I visited the US was in 1990 at the invitation of an old friend, Joseph Bernstein. After my arrival Joseph proposed and I accepted, but my essay is not about that. Joseph reintroduced me to his daughter, Mira, who was then in her late teens. I was struck by Mira’s charm. I had never before met teenagers like her. Of course, Joseph got points for that as I was hoping to have a child with him. When I moved to the US I met some other kids who were also incredibly charming. It was too late to take points away from Joseph, but it made me realize what a huge difference there was between Soviet and American teenagers. American teenagers were happier, more relaxed, better mannered, and less cynical than Soviet ones. My oldest son, Alexey, was born in the USSR and moved to the US when he was eight. One unremarkable day when he was in middle school (Baker public school in Brookline), the principle invited me for a chat. I came to the school very worried. The principal explained to me that there was a kid who was bugging Alexey and Alexey pushed him back with a pencil. While the principal proceeded to explain the dangers of a pencil, I tuned out. I needed all my energy to conceal my happy smile. This was one of the happiest moments of my life in the US. What a great country I live in where the biggest worry of a principal in a middle school is the waving of a pencil! I remembered Alexey’s prestigious school in Moscow. They had fights every day that resulted in bloody noses and lost teeth. When I complained to his Russian teacher, she told me that it was not her job to supervise children during big breaks. Plus the children needed to learn to be tough. No wonder American children are happier. I was wondering if there were any advantages to a Soviet upbringing. For one thing, Soviet kids grow up earlier and are less naive. They are more prepared for harsh realities than those American kids who are privileged. Naive children grow up into naive adults. Naive adults become naive presidents. I watched with pain as naive Bush (“I looked the man in the eye. I found him to be very straightforward and trustworthy.”) and naive Obama (Russian reset) misunderstood and underestimated Putin. Putin is (and, according to Forbes Magazine, has been for the last four years) the most powerful person in the world. Even though the US kept its distance from Russia, he was able to manipulate us from afar. Now that Trump wants to be close to Putin, the manipulation will be even easier. Putin is better at this game. He will win and we will lose. I have always wanted to be an honest person and have followed my honor code. Soviet Russia had two honor codes. One code was for dealing with people and the other for dealing with businesses and the government. I remind you that in Soviet Russia, all businesses were owned by the government. The money paid for work didn’t have any relation to the work done. The government paid standard salaries and the businesses did whatever. Generally, that meant that they were doing nothing. Meanwhile, the government got its income from selling oil. All people were being screwed by the government, so they had no motivation to play fair. Just as American workers do, Soviet Russians might use the work copier to make personal copies. The difference was that we didn’t feel guilty at ripping off the government. We wouldn’t just make a few necessary copies; we would make copies for our friends, our family, for strangers—as many copies as possible. I moved to the United States in 1990. Several of my friends took time to explain to me the difference between Soviet Russia and the US. One of the friends, let’s call her Sarah, was working as staff at Harvard University. She told me the story of a recent visit by a famous Russian professor. After he left, the department received a bill. It appears that the professor, in a short visit, used several months-worth of the department’s budget allocation for copying and phone calls. I was impressed, in a good way, by the professor who I assume spent a good deal of his time making a lot of copies of papers unavailable in Russia, presumably not only for himself but also for students and colleagues. On the other hand, it was clearly wrong. My new friend Sarah told me that in the US money does not come from nowhere, and I should include Harvard University in my honor code for people. Actually, not only Harvard, but also any place of work and the government too. Sarah also told me that since that budget problem, she was asked to talk to every incoming Russian visitor and explain to them how capitalism works. Most Russian visitors were ready to accept the rules. I too was delighted with that. It is much easier to follow one honor code than two. I was also very happy for my son, Alexey. He was eight when we moved to Boston. Before our move I had a dilemma. Should I tell him that Lenin and Stalin were bad guys and killed millions of people? If I gave him a truthful explanation, I would also have to teach him to lie. Otherwise, if he mentioned this at school or on the street, we would be at risk of going to prison. If I didn’t teach him the truth, he might become brainwashed and grow up believing in communism, which would be very, very bad. I was so lucky that I moved to the US: I didn’t have to teach my son to lie.